Considering it’s been over a year since my last post, it’s time to formally wrap up this blog. To all my printer friends, I’d like to suggest you head over to MarketingIdeasForPrinters.com/blog. Any blogging I do is going to show up there. And then there’s always the social media standbys of Facebook and Twitter … I hang out there, too. The Cree LR6 – A Beautiful Light! and The Cree LR6 – It Really Is That Good! Thanks for visiting, we’ll see you again in another corner of the Internet! I’ve had a day now to absorb all the info obtained from the 2013 Global Leadership Summit. This year marked my first year attending the event. It was life-changing … and I don’t say that lightly. This will, no doubt, become an annual event. Visions are Holy commodities – don’t kill them off! You get nowhere without followers who want to follow you. Help (coworkers) connect to why they’re serving others. Leaders are Diminishers or Multipliers. Watch out for unintentional Diminishers! Make room at the top for young eagles so they don’t have to leave. Move from agreeing with Jesus to doing stuff. On the Bible series: “God” movies tend to show His anger. I wanted to show God’s love. Six sources of influence exist. Each one will either work for you or against you. Manage the present, selectively abandon the past, create the future. The number one factor in getting from “here” to “there” is believing it can be done. The brain begins to change when you are out of control of circumstances that affect you. When talking about the word “church”: We think of “church” as a building, but Jesus meant a gathering of His people. I have to admit feeling a little saddened at all the red equals signs floating out there in social media circles the last few days. It saddens me to know that so many people are lending their support to the campaign for marriage equality. Now please … please, please, please … please don’t think I’m a homophobe. I’m not. I wish the whole equality discussion wasn’t an issue at all, but judging by the number of red equals signs I’ve seen … it’s going to be an issue. So, regardless of your sexual orientation, who are you trying to please? If you’re living for yourself and have no room for Jesus Christ, then being gay really isn’t an issue at all; you only need to please yourself. I would suggest if you’re living for yourself it’s much more important to get right with God, whether you’re gay, straight, short, tall, or ______ . (Fill in your own blank.) He’s the One who created you, and He loves you no matter how you filled in that blank. I hope you have time to watch the whole thing, but if you can only take a little bit of time I’d like to suggest the most relevant part of Pastor Matthew’s sermon can be found from 33:02 to 35:50. And then … consider shifting the bottom line of the red equals sign so it’s pointing in a different direction. That shift in perspective makes all the difference in the world! I fear that healing for this land will not come easy if we aren’t willing to let God take His rightful place in our lives. And while I know that there are certainly God-fearing members of the Democratic party, if this voice-vote is any indication it does appear that roughly half of the Democratic party feels that they’ll be just fine to not include God in their party. Christians, remember that on election day as you decide which party will best represent your values. For the last few weeks I’ve really been struck by the excellence I see in our children. “Excellence” is, I believe, one of those words that can get overused to the point where the true meaning gets overlooked. If you look up the word “excellence” in a dictionary you’ll probably see a definition that speaks to the ability to excel at something. That’s exactly what I’m seeing in our kids. They have all demonstrated their ability to excel. Emily is really developing into a pretty darn good cross county runner! Even though she’s in eighth grade, she has been given the opportunity to run varsity cross county races … and she does quite well! It’s so much fun to watch her race and see her excel as a runner. Tessa is in fifth grade this year which means she’s starting a band instrument. I spent some time with her trying to help her find out which instrument would be the best fit, and we settled on the oboe. This is a pretty big deal because oboe is one of the more difficult instruments to learn. Tessa is a natural and she’s doing great! It’s fun to watch Tessa excel on the oboe! Andrews excellence is showing up in a way I didn’t expect. It seems as if he’s turned into a protector of sorts for one of the kindergartners at school. He found out that one of the kindergarten girls was getting picked on a little bit at recess and he told her that if she ever gets picked on that she can come and find him and he’ll take care of her. It appears that this is something he’s done all on his own! It’s really touches my heart to know that Andrew is excelling as a trustworthy friend. This is only a small sampling of the excellence I see in these wonderful kids! I could go on about soccer, piano, art, and all kinds of stuff. But that would get boring quick, so I’ll just close by saying it’s such a treat to see these kids develop their excellence! 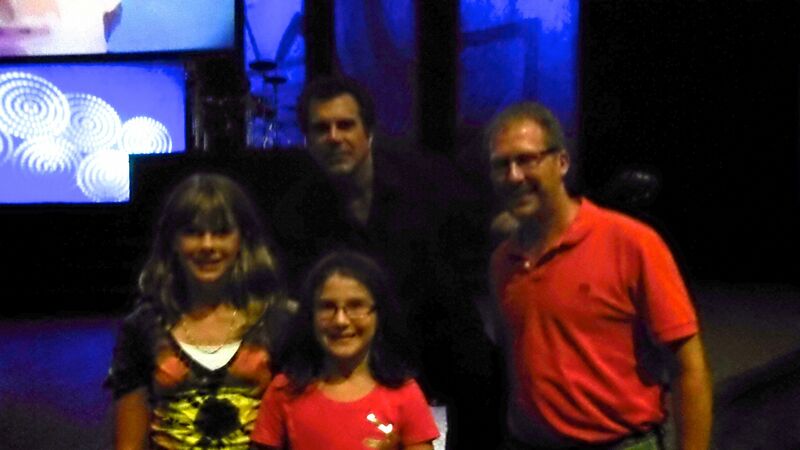 “Way back when” … in the late 1980’s and early 1990’s … I had the opportunity to see Carman concert four different times. 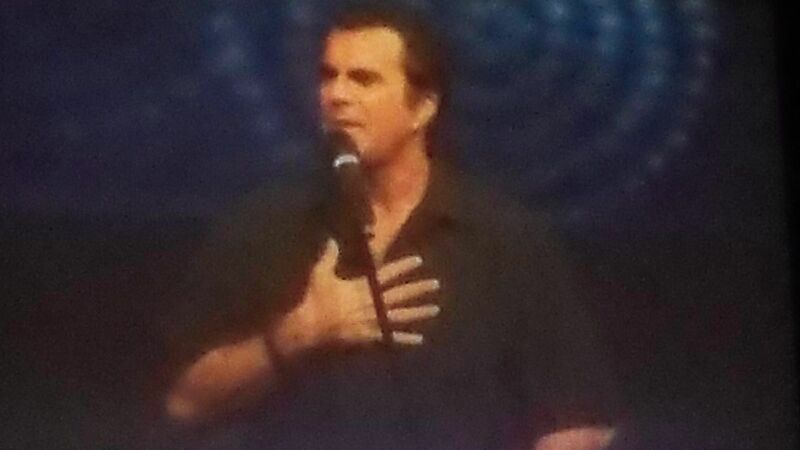 (If you don’t know who he is, Carman is a Christian music superstar with a bio that just doesn’t stop!) One concert in particular was a life-changer. I was hooked on his music and his message, and more importantly his music and message got me fired up for Jesus in a way I had never felt before! That night I learned that being a Christian and having fun are not mututally exclusive. Fast-forward 25-ish years later. Never would have I imagined I would have had the opportunity to see him in concert again. Thankfully, my imagination was incorrect! Tonight I had the opportunity to hear him one more time at Fargo’s First Assembly. This time, however, I had the opportunity to share the excitement with a new generation … my kids! (Well, two of my kids. Andrew just doesn’t enjoy the concert scene yet.) The truth is I’d already hooked them on his music when I first played The Champion for them. Emily and Tessa were very excited to join Judy and I at tonight’s concert! The bottom line: We had a blast! And who knows? Maybe this still wasn’t the last time to see him in concert! As I have gone through the area of the old homestead where I lived as a child, it brings back many memories of the past. The farm that dad farmed was only one quarter section; one half mile from the Pembina – Walsh county line with the farm in Pembina county. The living place was a plot of about six acres in the woods on the south west corner of a quarter that belonged to Ole and Haver Foss. The north branch of the Park River flowed through it which made it a nice living place. The farm place was about five miles west of Hoople. Dad farmed only one quarter of land. He used about ten acres of that for pasture and the rest for wheat, oats, barley, corn and a few potatoes. When the grain was up and the mustard began to bloom four of us boys, Merton, Vernal, Alvin and I had to go out to hoe the potatoes and corn. In the spring we had to herd the cattle along the roadside until the pastures got high enough to feed the cattle. After the fields had been harvested we would put the cattle on the fields to pick up any grass that may have come up. Sometimes we had to stay out of school to help. The house on the homestead was on high ground. It was not as we think of a house for ten children. The kitchen was a good size and so was the living room. One small bedroom was on the main floor and there were two rooms upstairs, one large and one small. Doris and Ann slept in the small one. Where did the boys sleep? I remember Vernal and I slept on a wood bed while we were small. When the wooden bed was discarded, Merton and Alvin slept on one end of the full size bed and Vernal and I slept on the other end. By that time some of the older boys were working away from home. When it came to meal time you can imagine what it was like. At times there weren’t enough chairs to sit on. One time dad’s brother, Uncle Olander came to visit. He made a couple of benches which solved the problem. When there was company there wasn’t enough room around the table so it meant some of us had to heat later or take our plates elsewhere. Besides the house there was a log barn with a hay loft. There was never enough room to store the hay for the whole winter. Hay had to be hauled in from time to time all by team and hands. Soon the logs began to rot away and a new barn had to be built. The solution; dig out an embankment and make a basement barn. The ceiling and hay loft roof was taken over to the basement barn and used for the top, so we still had a place for hay. The granary on the place had at one time been a log house. It had two lean-tos, one on each side. The west side was used for oats, the middle section for wheat and the other lean-to was used to house the old model T car. One day dad drove the model T into the garage and went right on through, down the river embankment and came to a stop before it hit the river. The end of the garage flipped back down and the car had to be pulled back up. At threshing time the grain would be hauled from the thresher with team and shoveled into the grain bins (there were no elevators then). We younger kids had the job of keeping it back as it was shoveled in. We had a smaller granary that was used primarily for wheat. When it came to grinding feed, we used an old burr mill powered by a six horse power engine that was always hard to get started which was done by pulling the flywheel and using every trick imaginable to get it going. The same engine was brought up to the house to run the washing machine. The washer was an old wooden machine that was made for washing by hand but Helmer fixed to up to be driven by engines. Helmer, Arvid and Leonard bought the first Maytag washer about 1928. Helmer took it upon himself to build a cistern. We no longer had to carry water to wash from the river or well. This was a big improvement. The Hartford school that we went to was less than a mile from home if we went across the pasture and field. If we followed the road it would be a mile. In the spring when the water was up in the river we had to follow the road until the water went down. In the winter through high drifts and heavy snow we walked the short cut to school. All ten of us kids went to the Hartford school. Ann was the only one that didn’t finish the eighth grade there as we moved to Hoople so Vernal and I would go to high school. The Hartford school was a small white building on the corner of McDonald’s land. It had six or seven trees on the yard, a barn and two outhouses that usually ended up in a snow drift in the winter. The barn had been used for the teacher’s horse in former years when that was the transportation. When I was in the fourth grade the school was remodeled to have a basement, two restrooms, cloche rooms and a furnace. Up to that time it was heated with a pot – belly stove on the main floor with a long string of stove pipes to the chimney at the far end of the building. All classes were at the front of the room. Classes would begin at 9 am with a 15 minute recess and noon hour (this was only half an hour in the winter). My classmates were Norman Langrude, Glenn Riley, Donald Matter, Vernal and for a time Margaret Olefson. Margaret was a real ‘tomboy’. She could take me down and sit on me or take some of the other boys down and sit on them. Vernal and I started together as we were only fifteen months apart in age. At the same time Russell, Merton and Alvin were also going. In a couple of years Russell and Alvin would finish and Ann would start. In the winter Russell would go early to start the fire for the teacher. When Russell finished school the job fell to Merton. The students had to sweep the floors and clean the erasers. Punishment for misdemeanors was to stay in at recess of after school. There are funny things that did happen in school. Alvin was to write the final examination for the eighth grade that was sent out from the county superintendent’s office. One of the questions asked was “what book was the character – John Silver in?” Alvin didn’t know the answer as he had not read the book, Treasure Island so he left it blank. The teacher in looking it over said she would not send it in if he didn’t fill in the blank. The only John Silver he could think of was in the comic strip from the newspaper, “The Katzenjammer Kids” which he put on the examination paper. The teacher didn’t like it very well but she did send it in and he passed the exam. Another time just after school was dismissed for the day, Vernal and Reynold Bodmer ran through the school with muddy shoes. As the started to go home the teacher called Vernal to come back and clean up the mud. Vernal’s answer was “What are you hired for?” He had to stay after school. Doris tells of one of her teachers that brought willow sticks to school to discipline the kids. She called them her “gads” and evidently used them. Think what would happen today if a stick were used to discipline students. There were many experiences that go back to our very early years. We had very few boughten toys and things to play with when we were kids. Vernal and I frequently went to the back of the small granary where dad had thrown some of the old worn out parts. We would have fun playing with some of the junk. Sometimes we would mix water with clay. Sometimes we’d mix water and ashes that had been thrown on the river bank and try to form it into a house or some other structure. I marvel that mother was able to keep track of us all the time. One time in the spring when the water was high in the river we were allowed to go to the place where the straw shed had been built in the barnyard and make a swing on the poles that had been left from the top of the shelter. We sat there swinging and enjoying watching the water flow by. Water has always fascinated me as can be proved by the fact that when the water was low in the late spring I would build a dam across the river so the water would get high on one side. I would try to have an outlet in it that would let some water out to keep the dam from breaking. I recall one time that the dam broke and it let out so much water that dad who had been on the other side had to take a long way home. Sometimes Vernal and I played with the toads we had found. One year our neighbor had Vernal and I trap pocket gophers on his summer fallow. He gave us a nickel for each one caught. We would set the traps one day and check them the next day. That summer we caught one hundred and five gophers. We didn’t get rich on it but we had something to do. When he cultivated the fields he would watch for the sticks we tied the traps to. He would take time to move them out of the way. The other six boys usually had a job in the neighborhood. Vernal and I never had a gun of even an air rifle. The next best thing was to make a slingshot. We became pretty good with the slingshots. It was not unusual to see us boys walking around the yard with a slingshot in our pockets and a pocket full of stones. Stones were a scarce commodity in our area. We often broke old pieces of iron to use for ammunition. Sometimes dad would take us a couple of miles west to a gravel pit. We would gather a bag of stones that would last for awhile. There were certain birds that would be our target. These included blackbirds, sparrows, and a number of others. Robins, orioles and most song birds were safe from our slingshots. We didn’t have a gun so it was rather difficult to hit a gopher with a slingshot. We would catch them with a snare that was put around a hole and wait until the gopher would come up and out. We would pull the twine and catch a gopher that way. Arvid was the hunter of the Hultin family. During the winter months he hunted skunks, raccoons and badgers. He also trapped weasels and mink. Many of the furs would be stretched out on the back of the old granary. It could get pretty well perfumed around that area. I remember hearing it told of Arvid shooting at squirrels with his twenty – two rifle. He shot several times at a squirrel and missed it. Alvin sneaks up with his slingshot and with one shot brought the squirrel down. We got quite proficient with the slingshots. We four younger boys, Alvin, Merton, Vernal and I were together more than we were with the older boys. Henry and Norman Langrude made frequent stops at our house especially in the summer when the chokecherries and black haws were ripe. We know where the best ones were and would find them to eat. Our teeth would be stained from them as we would eat them by the bucket and also Juneberries. It was our duty to find and pick the berries for mother to make preserves for the year. This began with the gooseberries which took a lot of time to get them from the thorny bushes and even more time to pick off the stems. Mother usually did that job. The chokecherries were easier to pick and didn’t take as much time. Later in the summer the plums ripened and we would go plum picking. Doris often joined us for this. We would take a bag and when it got full we would set it in the brush for dad come with the car and pick up. We usually picked a pail full for the land owner as a good will gesture (Jimmy Milchel’s woods.) I have seen very few places where there were as many black haw berries as there were in that area. In the late fall we would find a few hazel nuts. They were good but often were full of worms. After Doris finished high school in 1931 she worked a summer for Mary Hurtt. She also worked as a telephone operator in Hoople. The next year she left for Chicago Evangelistic Institute. She worked in a home to take care of her expenses. While she was there, mother died January 3, 1931 from pneumonia. Doris came home at that time and stayed until 1935 when she, Vernal, Ann and I moved into Hoople so we could go to school. Mother was 52 years old when she died. The next four years we lived in several different places in Hoople until we were all finished with high school in 1938. I worked one summer at Ted Holts. Merton was working at Henry Jackson’s farm. I left Hurtts in January 1933 and went to Chicago to attend Chicago Evangelistic Institute. It is now known as Vennard College of Iowa. I came home in the summers to help on the farm. One summer I worked at Bethany Orphanage at Bethany, Kentucky. I began my pastoral ministry at Hannah and Wales, North Dakota while attending University of North Dakota. From there I went to rural Mandan and Fort Rice, North Dakota. I served the United Methodist Church at Turtle Lake and McClusky, North Dakota next. The next three years I served a point parish which included Sterling, Braddock, Moffett and Driscoll, North Dakota. Then I moved on to Hazen, Beulah and Zap in North Dakota. We lived at Hazen at the time they had the Zip to Zap at Zap, North Dakota. We were assigned to Tuttle – Robinson parish next. From there we moved north to a point charge of Rocklake, Clyde, Egeland. Then to the southern part of the state to Marion and Dickey. I retired in 1986 and moved to Minot, North Dakota and served two years as a Visitation Pastor. In 1988 I had a heart attack. I met Frieda when I was pastor at the Turtle Lake United Methodist Church. We were married August 3, 1964. Reverend Everett Owens officiated. I think it was the hottest day of the year – 103 degrees. Frieda doesn’t remember it being that hot. David was born July 22, 1968. Judy and David met at work in Fargo. David is assisting manager and Judy works Graphic Arts on the computer. Both are employed at Express Press. They have a little doll, Emily Elizabeth born August 26, 1998.